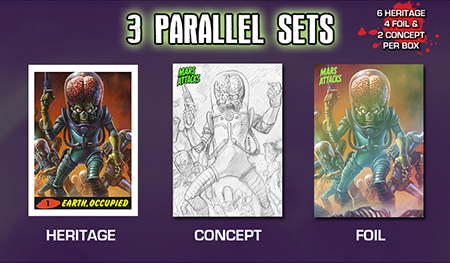 2015 Topps Mars Attacks: Occupation is taking a different approach to marketing and distribution. Rather than going through dealers and distributors, the card maker is launching it as a Kickstarter, allowing collectors to pledge money in exchange for cards, boxes and other rewards. 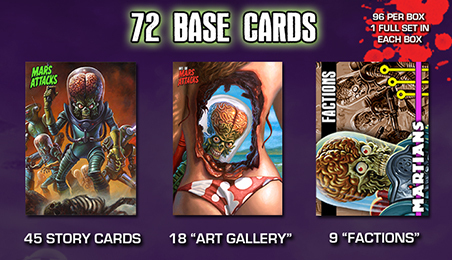 The base set a followup to the one told in 2013 Topps Mars Attacks: Invasion. The Occupation set has 72 cards. This includes 45 story cards as well as two subsets, Art Gallery (18 cards) and Factions (nine cards). 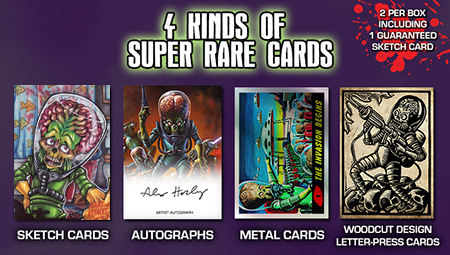 Story cards feature the artwork from a variety of artists like Ed Repka, Dan Brereton and Alex Horley. Art Gallery cards have new images that may not fit into the regular story. Factions cards look at the characters and groups that make up the expanding Mars Attacks universe. Each 2015 Topps Mars Attacks: Occupation box should have a full base set with a few doubles to spare. Parallels come in three forms. 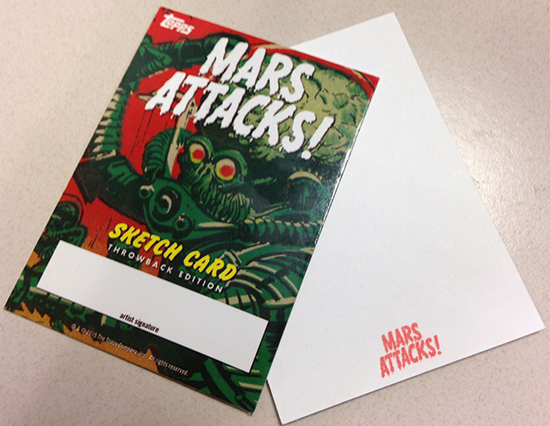 Heritage recreates the 45 story cards on vintage-style card stock with the iconic 1962 Mars Attacks design. These are inserted six per box. Landing two per box, Concept parallels show early sketches of the 45 story cards. Finally, all 72 cards are given the Foil treatment. These fall four per box. Sketch cards make up a big part of the product's premium chase. While each box promises at least one, they come in a variety of form. Red Logo are the most common, followed by Green Logo. Rare Creator Sketch Cards have artwork from those who also worked on the base set. Dual Artist Sketch Cards aren't in packs. Rather, the over-sized cards are inserted randomly as box toppers. Finally, there are the extremely rare Throwback Sketch Cards. These have artwork inspired by the original Mars Attacks set. Each artist did no more than one of these. 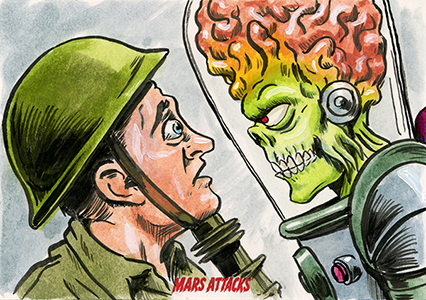 All 2015 Topps Mars Attacks: Occupation sketch cards are done in full color. Unless there's a second sketch card, collectors will find a second premium insert in each box. Autographs include artists and what Topps describes as "special guests." 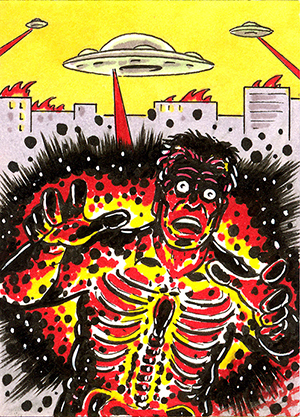 Metal Cards recreate the original Mars Attacks cards on silver stock. Finally, there are four different Woodcut Letter-Press cards with designs from Brian Reedy. 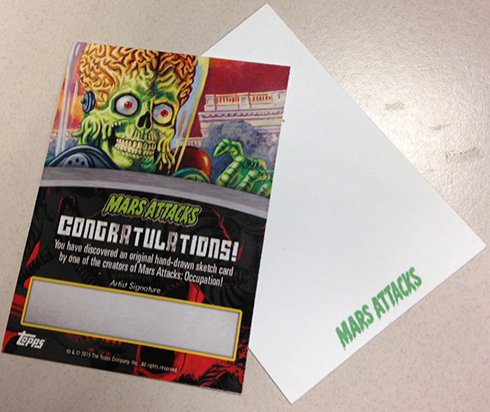 2015 Topps Mars Attacks: Occupation also has three additional basic insert sets that haven't been unveiled yet. Each has six cards. Boxes have ten of these cards combined. 2015 MARS ATTACKS OCCUPATION ORIGINAL1962 SERIES METAL #43 "BLASTING THE BUG"
Mars Attacks Occupation. Kickstarter Dinosaurs Attack Exclusive Metal Card. 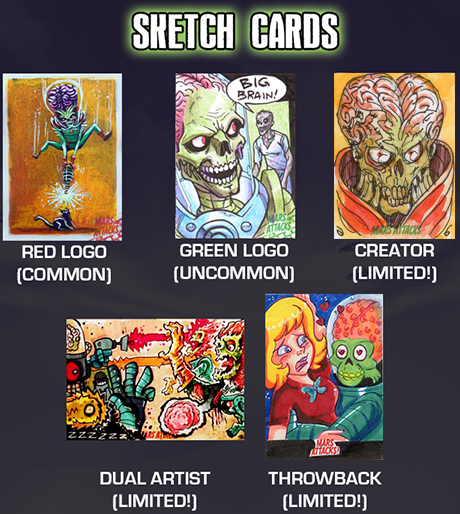 The following is an early list of artists slated to contribute sketch cards to the product. When will this series release?? grizzly � It is out now.